Successfully Added X5 Mini PC - Dual-OS, Android 5.1, Windows 10, Quad-Core Intel Atom CPU, 2GB DDR3 RAM, 128GB SD Card Support, 4K Support to your Shopping Cart. The X5 Mini PC is remarkable in the sense that it treats you to two different operating systems. By supporting both Android and Windows, you’ll be able to enjoy the best of both. This mini PC lets you use Android 5.1 to make use of the latest Apps and games whereas Windows 10 brings along great efficiency with all its trusted MS Office features. Whether you use this beauty for work or entertainment, the X5 Dual-Boot mini PC is sure to meet your demands. It features a compact and lightweight design. Thanks to this, you’ll be able to carry it along anywhere you go and turn any big screen TV into your own personal computer. Although small in size, this Dual-OS mini PC comes with some sophisticated hardware. A Quad-Core Intel Atom processor lets you tackle the latest Apps and programs. Additionally, your mini PC treats you to 2GB DDR3 RAM, 32GB ROM, and a 128GB SD card slot. Simply connect it to your TV and you’ll be able to enjoy games, watch films, and browse the web. It even supports Bluetooth 4.0. Therefore you’ll be able to use your mini PC with different gadgets such as wireless keyboards and speakers without encountering any trouble. By supporting 4K media, this mini PC lets you play stunning Ultra-HD films. This lets you enjoy your favorite movies and sports games in stunning detail. It furthermore comes with an Intel HD Graphics 400 GPU. This piece of hardware provides you with sharper images and vivid colors whenever you use your mini PC for entertainment purposes. To increase your overall experience even further, it supports 5.1 surround sound output. From now on, you’ll be able to turn any large screen into a PC and enjoy films, music, the internet and more. With the X5 mini PC at your disposal, you’ll never have to experience a moment of boredom again. 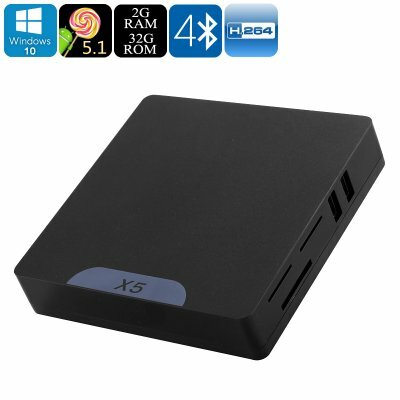 The X5 Mini PC comes with a 12 months warranty, brought to you by the leader in electronic devices as well as wholesale mini computers.. The OS version on this device cannot be upgraded or flashed and any attempts to modify the default OS will void the warranty. As a wholesaler, we provide no software support, advice, or training regarding the Android operating system and software.